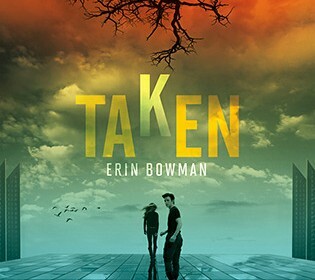 Taken, by Erin Bowman is fresh new take on the Dystopian genre of books on today’s market. Hunger Games and Divergent can’t even come close to this masterpiece of a novel. Erin Bowman pieces together a world in which the characters of Taken find themselves caught in a struggle between love and duty, and good and evil. Taken revolves around Grey Weathersby, who has spent his whole life in a village surrounded by an enormous wall. No one in Claysoot can remember how they came to live in the strange town. When a male in Claysoot turns 18, he is heisted from the town. The heist is a mysterious bright light that shines down onto a male on the night of their 18th Birthday, no one knows where the men go or what happens to them. When Gray’s brother Blaine is heisted, Gray discovers a mysterious letter from his mother revealing a secret that forced Gray over the wall. Only to find a world larger than he could ever dream of waiting for him. The setting for Erin Bowman’s Taken is a post-apocalyptic Dystopian world. Taken has a few themes present throughout the entire story, the most prominent being curiosity, which acts as the base of Taken. The story progresses because each of the individual character’s curiosity pushes them to make decisions of whether or not to act on a situations. Erin Bowman encourages readers to think about why the different events in the book are happening, while keeping readers craving for answers to each question. The characters in Taken struggle with internal distress throughout the book, such as heartbreak, grief, loss and uncertainty. Each of them face their own challenges in the discovery of the mysterious domed city, while adapting to the strange new world. Erin Bowman draws her writing style from many sources, one of the most prominent being J.K Rowling (author of Harry Potter). She has stated that she admires Rowling’s work, and strives to achieve that level of profession. Characters are relatable through the entire story and Bowman relates to anyone who has ever been hesitant in trying new things. Taken is especially recommended to teenagers, because both teenage boys and girls can relate to the many emotional challenges characters struggle with. Taken is a read that nobody should miss, with the feeling of curiosity and the themes of uncertainty surrounding the whole book, readers will become increasingly enraptured by the engaging story with every turn of a page.